Your listening to Bonny Portmore from Irish Midis. 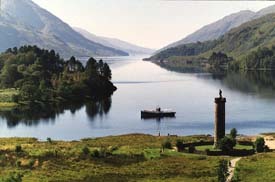 Both Duncan and Connor were born in Glenfinnan, on the shore of Loch Shiel. Travel to their village, the Castle that Connor lived in after he was cast out, or the Inn that Rachel MacLeod runs, modern day.